The markets are ending all over the county. A few have a week or so to go. Tomorrow is the last Ellicott City market. As for our CSA, yesterday we picked up our last summer share. There were 44 of us at our host’s site. Fall veggies were the norm in our boxes, but it still was considered the summer CSA. It was greens heavy, as usual for this time of year. 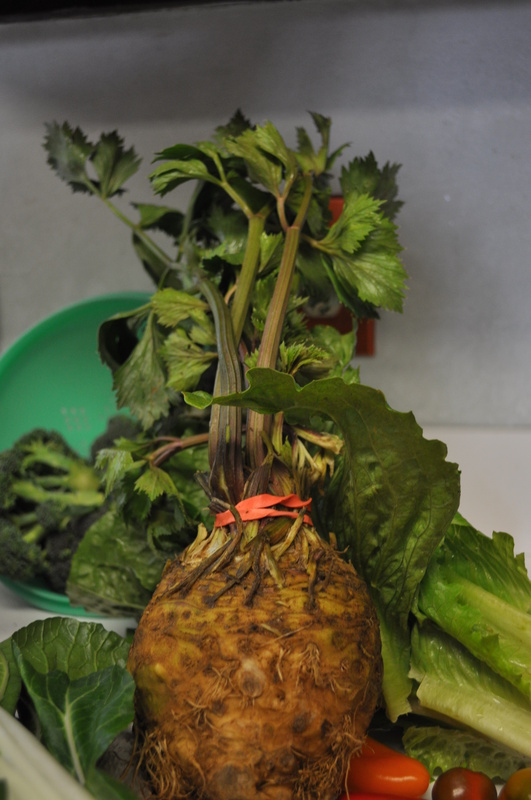 This was also the second week we got celeriac aka celery root. This week it included the leaves. Looking them up online I see they are in fact edible. There was an interesting discussion at the pick up site about how we get our veggies. If it is in the box, it is edible. We get carrot tops, beet greens, kohlrabi leaves, all sorts of things not found in our local grocery stores. What did I do with that celeriac? Sliced it and froze it. Same with the leaves. It will be used in stocks all winter. 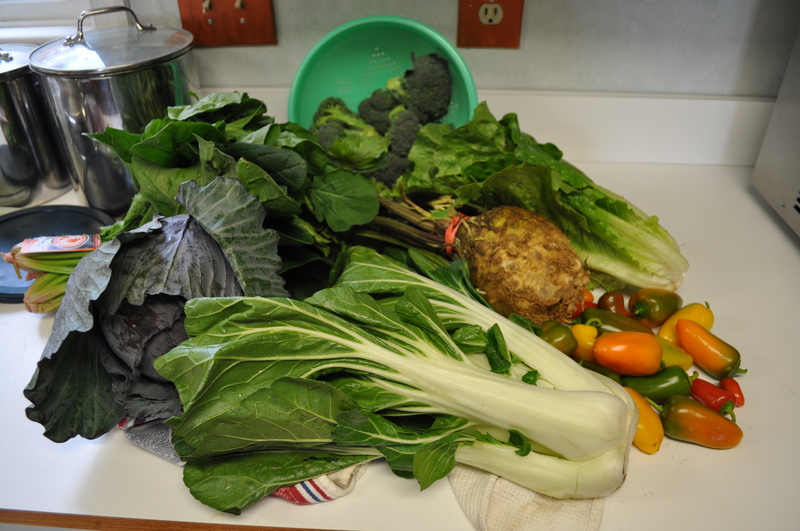 As for the rest of the box, there was romaine, red cabbage, broccoli, spinach, bok choy and sweet peppers. There was also kale but since I grow it in my garden, I did a swap to get beautiful arugula. I had used the last of my home grown arugula in a pesto, so this fresh large stuff in being used with goat cheese for salads. Next Thursday 28 of us will get our first fall CSA box. Then, the following week two more people join us. Fall CSAs aren’t as popular as summer. People seem to think all we get are potatoes and turnips. Still, we are happy. We met the minimum to continue a Columbia pick up site. I look forward to celery and Jerusalem artichokes. To exotic pumpkins and maybe salsify. Who knows what surprises will come every Thursday? Posted in CSA, Dark Days, Food, LFFC, Locavore, Winter Eat Local and tagged CSA, Food, foodie, Locavore. Bookmark the permalink.